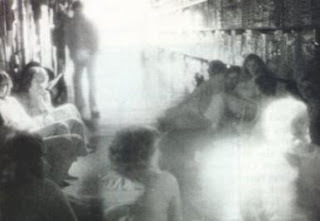 Here's the photo allegedly showing the ghost of Toys R Us, the tale of whom we cover in "Ghost of a Chance". Legend has it that the crew of "That's Incredible" shot several rolls with both infrared and regular high-speed cameras. The ghost is said to be the figure leaning in the background of this infrared image, and is not present in the high-speed version of the image. None of the sites I visited featuring this photo supply the non-infrared version. Go figure. Can't get enough of "The Day the Earth Stood Still" redux? Check out: WNYC's program "Studio 360:"
"Alien Fact-Checker. Kurt asks Dr. Seth Shostak about how he advised the filmmakers on the set of the new movie "The Day the Earth Stood Still." As the Senior Astronomer for SETI, the Search for Extraterrestrial Intelligence, Shostak believes that aliens will contact us, and he can’t wait." Does "Day the Earth Stood Still" Get the Science Right? "PASADENA, Calif. — Of all the movie promotions in all the towns in all the world, Keanu Reeves had to walk into this one: a California Institute of Technology forum at which he was asked, “How could an alien being grow so fast without violating standard mass- and energy-conservation laws?”..." Read the rest. Picture this: Our environmental depredations have cheesed off nearby aliens, and they decide to send one of their own to Earth to save the planet. Sound reasonable? 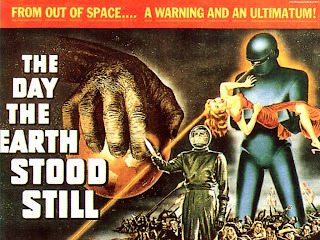 Well, that’s the premise of The Day the Earth Stood Still, a remake of the 1951 classic sci-fi film of the same name. The alien is played by Keanu Reeves, and his right-hand robot, Gort, is played by some computer graphics. It’s going to be a film you won’t want to miss. And Seth was technical adviser on the film, so if you find any science errors, you can direct your fury to him. Check out his description of what it was like to be on the set with Keanu, John Cleese, and Jennifer Connelly here. As you'll hear in this week's show, "Got Life? ", Seth and Molly gave me a copy of Spore to play so that we could get a better understanding of the game. Well, a few hours turned into a week, and a cell turned into a galactic empire, just as the game's creators promised. I actually decided to start over as an herbivore, and made it through each phase as a friendly, diplomatic species, who are currently under attack by the Wirbleflubby, a species from a nearby star system whose requests for communication I accidentally ignored. Oops. I also ran a carnivore through the first 3 phases, eating and destroying everything I could. They're about to start the Civilization phase, which should be interesting, as they're anything but civilized. In another game, I ran a carnivore through the first three phases as a friendly diplomat. Getting through the creature phase without killing anything was hard because I could only eat corpses. Fruit bad, corpses good. Go figure. In yet another game (yes, even eating and sleeping were annoying interruptions last week) I found the rare omnivore mouth type during the cell phase, and I'm working on getting through the Tribal stage both hunting and gathering. If anyone has any questions about Spore, I'm the most likely one here to have answers. And if you know how to win over the Wirbleflubby without selling all my artifacts, please let me know!